I wasn’t sleeping last night because my mind was simply not really wanting to shut-down. I happened to come across a Life Hacker article on ‘reclaiming your rest’ giving some insight into panic attacks and practical ways of combating sleeplessness when you really need to be sleeping! One very practical way I’ve found that does work is to get out of bed, grab a book and a glass of milk and give it 30 minutes and go back. Often times I’ve been woken up because I was simply hungry, especially after a hard session in the gym. I was reading Hebrews 4 this week which is why the phrase ‘reclaiming rest’ caught my attention last night. The writer to the Hebrews relates the word ‘rest’ with believers who have come to trust and know God and, therefore, unbelievers who haven’t (Heb. 4:3) – i.e. 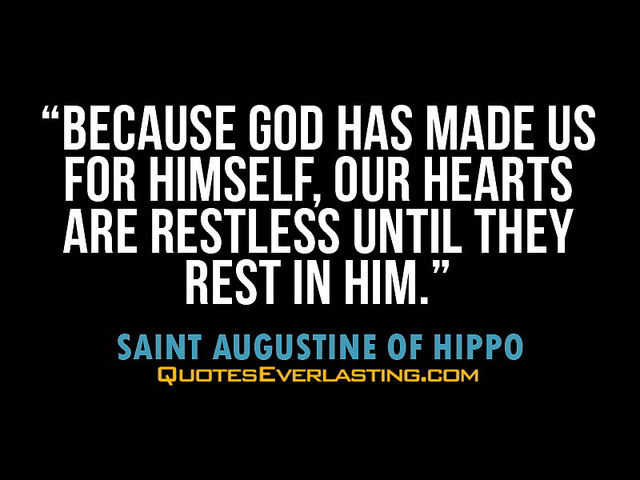 rest is synonymous with salvation and restlessness with being lost. But the reclaiming of our rest in discipleship also includes the child-like faith in a good and kind Father who simply wants his children to be healthy (not just eternally saved) because trying to function well in life on poor or no sleep isn’t healthy. Sleep debt occurs when you regularly struggle to get enough sleep, whether self-inflicted or not (sometimes we just need to get to bed before Question Time). It’s a term that provokes an image of being out of money and not able to see ends meet. I don’t think our God wants us to live like this. So how can we reclaim rest aside from the practicalities that http://lifehacker.com/why-anxiety-wakes-you-up-at-night-and-how-to-reclaim-y-1665854013 mentions? The material world in which we are placed by God permits him to be nearer to us than even our own eyes, ears and brain are near. How does our loving of God with all of our mind (Matthew 22:22) relate to reclaiming our rest? Well, it’s faith, isn’t it? From first to last. How about we put into practice some mental gymnastics by faith, both before bed-time and in bed itself where our focus is on loving Jesus with more of our mind. Willard’s quote invited me to commune with God when my restless head was on the pillow – it invited me to begin to lift my thoughts to Jesus who is closer than our brains our eyes and our nose, literally. Come on! When we meditate on scripture at night when we feel restless, or when we meditate on scripture so that we don’t become restless, we’re doing more than counting sheep. Psalm 1:1-2 says that ‘blessed is the one whose…delight is in the law of the LORD, and on his law they meditate day and night’. There is a blessing in meditating on the right things. After all, isn’t panic and insomnia sometimes simply meditating on the wrong, life-sapping things? Be blessed and hope this helps to love Him with more of our minds and reclaim the rest that is rightfully ours as his beloved.